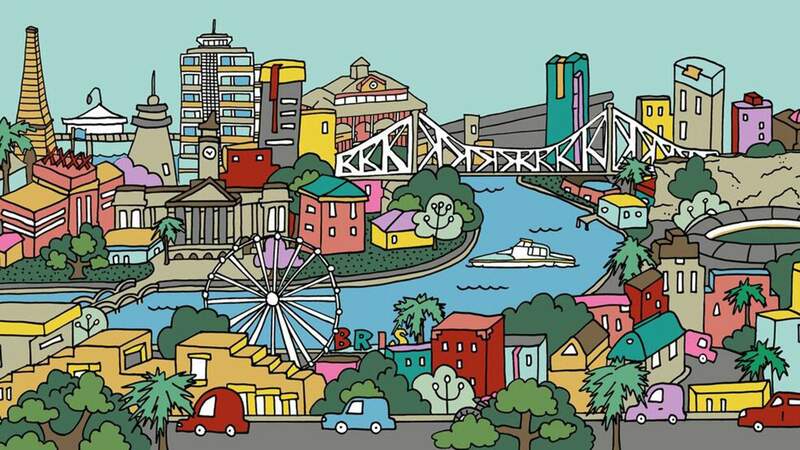 Brisbane gets the illustrated, interactive treatment. Seen every part of Brisbane there is to see? That's all well and good — but have you seen your hometown turned into an interactive, animated illustration? At the Museum of Brisbane, artist Megan McKean has created an exhibition called Bristopia that will help you explore the place in a completely different way. Adding Brisbane to her list of illustrated locales (alongside Paris, Palm Springs, London and Sydney), McKean's largest commission to date is a six-metre-wide rendering of all of the cities landmarks, from the usual suspects to the other elements that are part and parcel of living in Brissie. Think the Story Bridge, the Gabba and the snaking river, plus all those palm and jacaranda trees that locals just stop noticing. Oh, and scrub turkeys, of course. More than that, the interactive aspect of the exhibition lets you create your own ideal version using Megan's illustrated bits and pieces. If you've always dreamed of a city filled with more parks than Leslie Knope could even conjure up, here's your chance to turn it into your own picture — as part of a showcase that not only wants attendees to explore Brissie as it currently stands but to also think about its future.